Be sure to mark your calendars for our annual SUMMER SUNWEAR FASHION PREVIEW!! Dry eyes, irritated eyes, and blurry vision can be caused by poor nutrition. Ask your eye doctor if dietary changes or supplements will help. Don’t suffer from red, itchy, watery eyes caused by allergies. Your eye doctor can prescribe treatments to keep your eyes comfortable year-round. Do colors look faded? Changes in your color vision may be a sign of early cataracts or other eye health problems. Yellow eyes could be a sign of liver problems. See your eye doctor and general physician to make sure your eyes are healthy and your liver is functioning normally. Autoimmune disease is when your body’s defense mechanism against disease-causing microbes starts attacking normal, healthy cells. Dry eyes and dry mouth can be the warning signs of an autoimmune disease called Sjogren’s syndrome, which damages glands that produce tears and saliva. Your eye doctor can check for sun damage that can cause cancer of the eyelids and front of the eye. Remember to wear shades outdoors in daylight to shield your eyes from UV. Amyloid protein that builds up in the brain in Alzheimer’s disease may appear in the retina as an early marker of the condition. Detection requires a special test called SD-OCT. Both type 1 and type 2 diabetes can cause serious vision problems and even blindness. Routine dilated eye exams are essential to monitor of the disease. Early signs of damage from high blood pressure can be detected in a routine eye exam so potentially life-saving treatment can be initiated and adjusted as needed. During a dilated eye exam, your eye doctor can examine the health of blood vessels in the retina and detect signs of increased risk of carotid artery disease and stroke. Contact Good Looks Eyewear today at our Pittsburgh or Cranberry location for more information. Or Call to schedule an appointment! 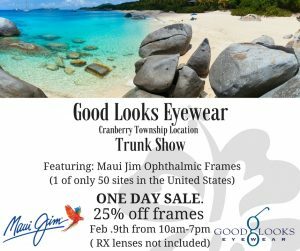 Good Looks Eyewear in Cranberry Township is proud to be one of 50 locations in the United States to carry Maui Jim’s Ophthalmic Eyewear Collection!! We absolutely know you will LOVE this new line!! Visit the Cranberry Good Looks Eyewear Feb. 9th between 10am-7pm and receive 25% off frames ( lenses excluded). Have you ever seen a speck or thread-like strand float across your field of vision? Many times these spots or floaters in your eyes are just an irritating consequence of aging. However, if these symptoms are new or get worse, it’s time to call your eye doctor. Read more about the symptoms, causes and management for this common eye condition. What are eye spots, flashes and floaters? Floaters are transparent spots, specks or lines that seem to move or “float” across your field of vision. They are actually small, semi-transparent or cloudy particles within the vitreous (the jelly-like fluid filling the back of eye). They come in different shapes and sizes and can look like insects, rain drops, dark spots, cobwebs, thread-like strands, or hair. Some move around more and other seems to be much less mobile. What causes spots and floaters? 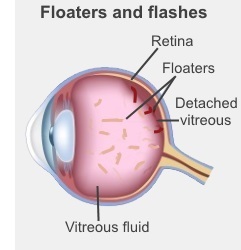 Floaters are flecks of protein or other matter trapped in the back cavity of the eye. New or large floaters are frequently caused when the vitreous gel detaches from the back wall of the eyeball. Although this sounds a bit scary, this typically happens as part of the normal aging process. Certain eye diseases or injuries can also cause floaters. Are spots and floaters serious? Most spots and floaters are normal, but sometimes they can indicate a more serious problem, especially if there is a sudden increase in their number or if they are accompanied by flashes of light. Flashes are brief, lightning-like streaks or arcs of light seen in your side, or peripheral, vision that may or may not appear with spots and floaters. They are similar to what you see when a flash goes off on a camera. Each flash only lasts for a split second. They are typically white and are more visible in the dark. Flashes occur when the vitreous gel tugs on and pulls away from the retina (the back lining of the eye like the film in the back of camera that receives visual images and sends them to the brain). Every time the vitreous pulls on the retina, you will see a flash of light. After the vitreous completely separates, flashes tend to become less prominent and usually completely stop over a period of several weeks. Another cause of flashes might be migraines. Flashes related to migraines usually last for about 15-30 minutes, tend to be colorful, shimmering, appear in both eyes simultaneously and may slowly move across your vision. They then completely stop and may or may not be followed by a headache. Is a vitreous detachment serious? Vitreous detachment is very common and rarely leads to serious problems. The vitreous detaches over several weeks, and the floaters and flashes tend to become less prominent. Sometimes, however, a vitreous detachment can cause small tears or holes in the retina. These holes can progress and cause vision loss if left untreated. What should I do if I see spots, floaters or flashes? If you suddenly see new spots, floaters, or flashes, if they get worse, or if you see a dark curtain progressing over your side vision, you should contact your eye doctor immediately for a complete exam. You will need a dilated examination (drops are used to make the pupil larger so the doctor can see the entire retina). This examination allows your eye doctor to determine if you have a vitreous detachment or a more serious problem like a retinal tear or retinal detachment. The dilated exam will make your eyes light sensitive and your vision blurry for several hours. In most cases, a sudden increase in spots, floaters, or flashes requires no treatment other than careful monitoring by your eye doctor. However an examination is extremely important to make sure it is a vitreous detachment and not a more serious problem such as a retinal tear or retinal detachment which must be treated quickly. For this reason when you call your doctor with flashes or new floaters they may want you to be seen the same day. Call or Visit Good Looks Eyewear in Pittsburgh or in Cranberry Township for more information.